Very early in the morning of Friday the 31th, I read in the news that the shipowner Alexandros Goulandris is intended to make the armored cruiser Georgios Averof sailable, a legendary ship of the Hellenic Navy (Πολεμικο Ναυτικό) and now for many decades a memorial and museum ship. I found it really funny to be honest, someone to spend so much money to repair an old museum vessel and make it sailable again when the priorities of the Hellenic Navy are so many and when the country is broke. 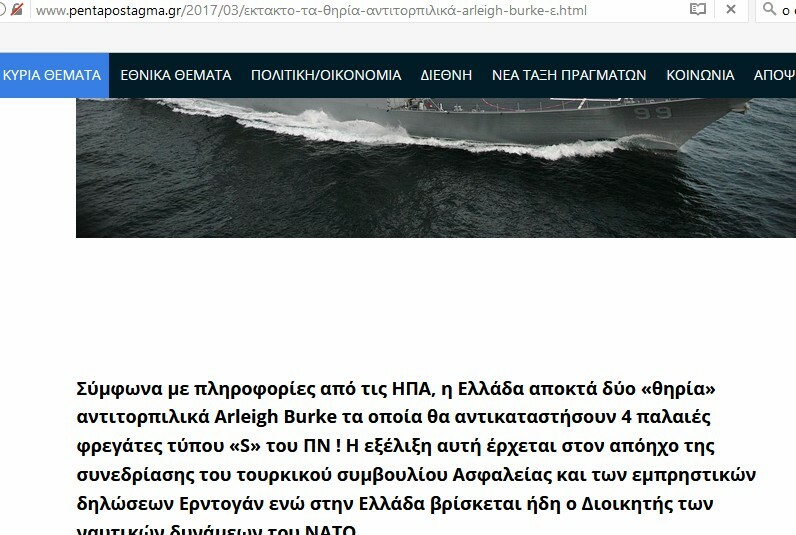 I am Greek as many of you know (or you can realize that from my posts that give an emphasis to the Navy of Greece), and as a navy enthusiast, researcher (operations research analyst) and amateur blogger, I do care about the future of my country's Navy. Therefore I wanted to raise up an issue, to see the reactions of the people and moreover to test the Greek media. This was not an easy decision for me to make and took a lot of consideration before I posted the fake news. I hope that my followers will not have bad feelings and enjoyed the joke as much as I did. I must admit also that I was not expecting that huge domino effect and the reproduction of my "news" in so many blogs and websites and most important in so many variations! I was also seriously "bombed" from dozens of phone calls and private messages. I decided quickly that my "news" should based on the most popular discussion the last two years in the defense media and forums: the free acquisition of second-hand Arleigh Burke class destroyers of the United States of America. 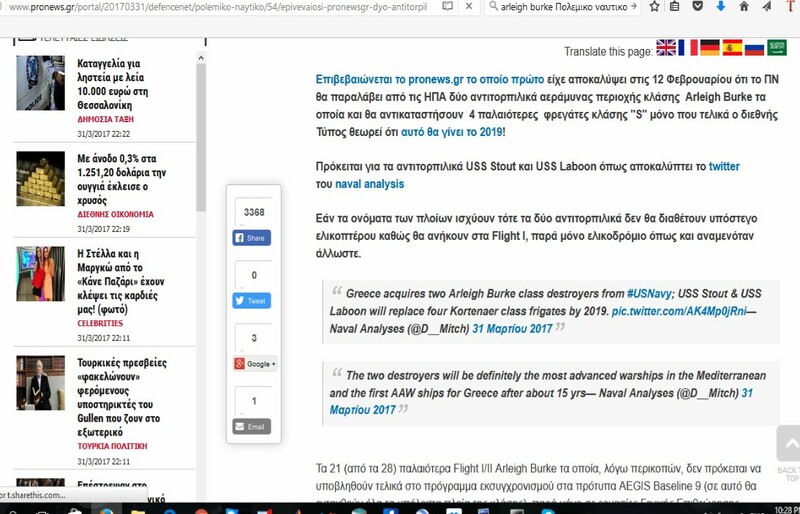 This is the dream of many Greeks (including myself) who desire to see a powerful Hellenic Navy with few but mighty ships carrying Standard Missiles (SM-2) that are capable to provide significant added range to the anti-aircraft 'umbrella' around the Greek fleet and the hundreds of Greek islands. Someone could remember an article I wrote about five months ago titled The major surface combatants of the most powerful European Navies in 2030 where I mention among others the lack of any plan for the future for the Hellenic Navy due to the country's bad economic condition. Today, Hellenic Navy has in its inventory 13 frigates but without any declared replacement plan for the future, 17 fast attack craft and 11 submarines of which the five (5) are some of the most advanced in Europe but the rest need replacement. The Navy looks quite strong but in reality the majority of the surface vessels and the submarines will be 30-40 yrs old after 2020! In addition to that the fleet has not dedicated anti-aircraft warfare (AAW) naval platforms and the anti-aircraft defense of the fleet is based on the ESSM (+50km) and the RIM-7P++ (25km) while the rest European naval powers have from minimum three (Germany) to maximum six (United Kingdom) AAW destroyers or frigates. The joke should be short, detailed and.. sensible. Moreover, in order to be as much as believable as possible, I decided that it should not be on the same day with the April Fool's Day, but just hours earlier. This was a "minor fault" let's say. I chose two old vessels in the Arleigh Burke class that will not be upgraded in the future and that have short names because Twitter has word limit. Therefore I posted the following one "news" on Facebook and Twitter. 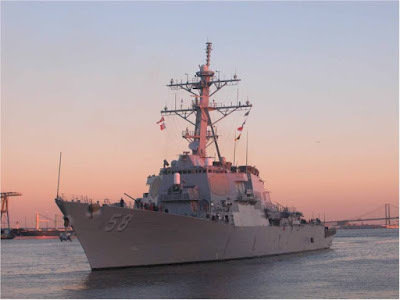 Notice that I did not mention any source something that should sound suspicious (for those who follow my page would know that this is something very rare for Naval Analyses blog). 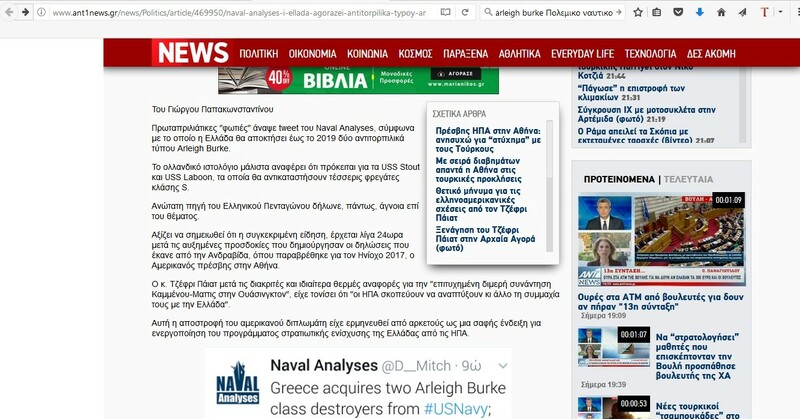 On Twitter I added the following phrase to underline the importance of the acquisition: "The two destroyers will be definitely the most advanced warships in the Mediterranean and the first AAW ships for Greece after about 15 yrs." 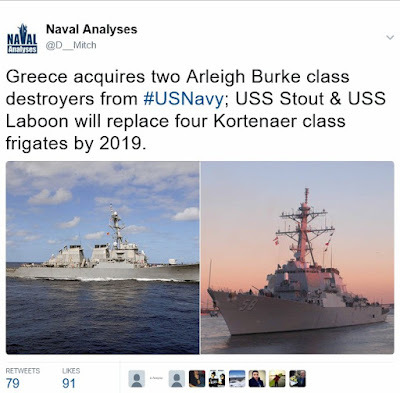 On Facebook I had much more space to write an even more detailed post:"Greece acquires two Arleigh Burke class destroyers from U.S. Navy; USS Stout (DDG-55) and USS Laboon (DDG-58) will replace four Kortenaer class frigates by 2019. 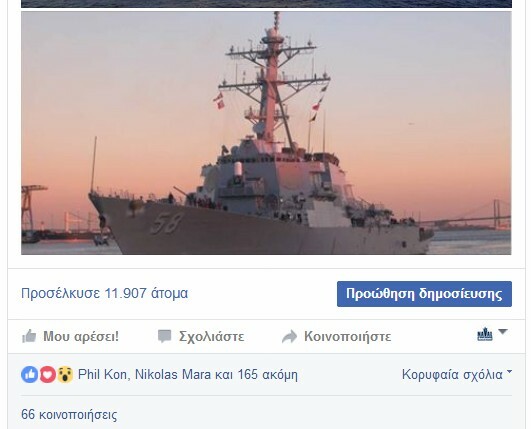 The frigates that are about to be decommissioned are Themistocles, Aegeon, Kanaris and Nikiforos Fokas. 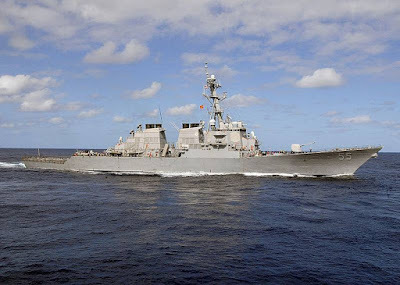 The destroyers will be delivered without their Phalanx CIWS, thus the four CIWS from the before-mentioned frigates (each ships carries one) will be installed on the two destroyers (two for each vessel). The two destroyers will be definitely the most advanced warships in the Mediterranean and the first AAW ships for Greece after about 15 yrs." The Facebook post and the reactions! And the domino effect began! 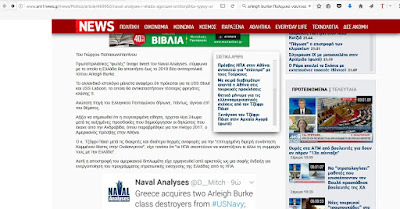 The "news" reproduced almost everywhere in Greek news blogs and websites. I mention here some of them and I highlight what changed in the text. First I should point out there were very few who contacted me to ask if this is real . Among them where e-amyna, idbam.blogspot.gr and proelasi.org, my favorite Greek defense news blogs. Those who run the blogs I mentioned, are indeed really professionals. 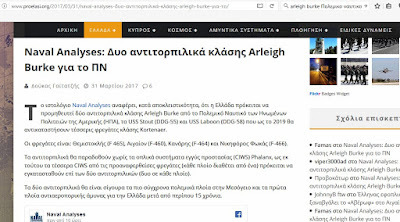 I answered to the e-amyna and idbam.blogspot but unfortunately I did not answer to my friend who run Proelasi (Προέλαση) who even asked my permission to re-post the news. The way he posted, is an example of journalistic professionalism. In that way, even if the news was fake or wrong, it was not author's fault. The post is here. 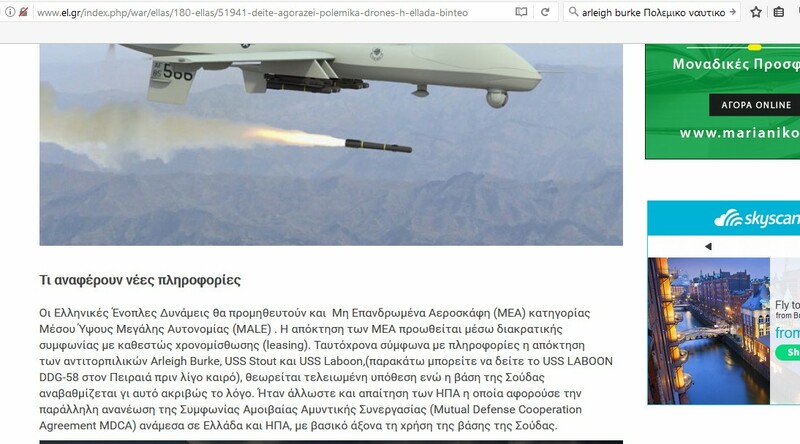 I was surprised also to see the very popular pronews.gr (former defence,net), a website that in general is the best example of bad media reporting for their own reasons, respected the original source and gave a link to my page and my post! Perhaps they thought is so good to be true and they wanted to cover their back, I do not know. But I thank them. The post is here. 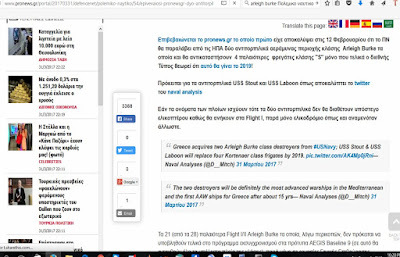 Οf course the post got reaaally big with a lot of information and that even confirms their theory about the acquisition of the two ships from U.S.! I noticed later though,checking on the time that the post was posted, that pronews.gr copied entirely pentapostagma.gr's post with the only but important difference, is that the author added the source i.e. my page! The comments also were really interesting, showing that the society wishes to see a strong Navy to defend the country. 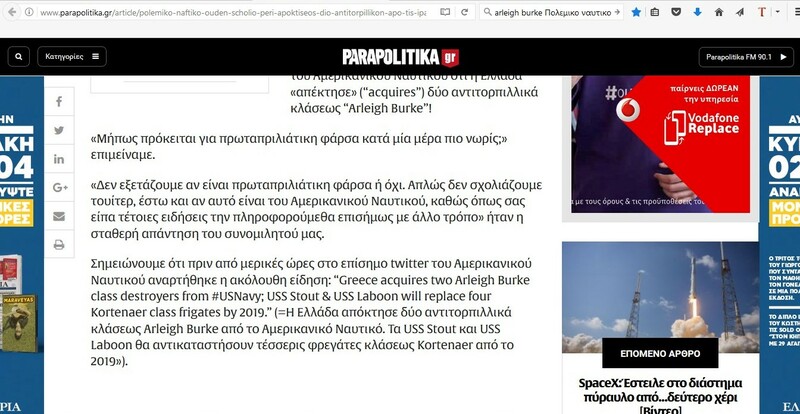 The armynow.gr copies and mentions properly the defencepoint.gr as the source for the text but provided also a link to my original tweet which I really thank them for that. That's professionalism. The post by armynow.gr and how well linked my page. 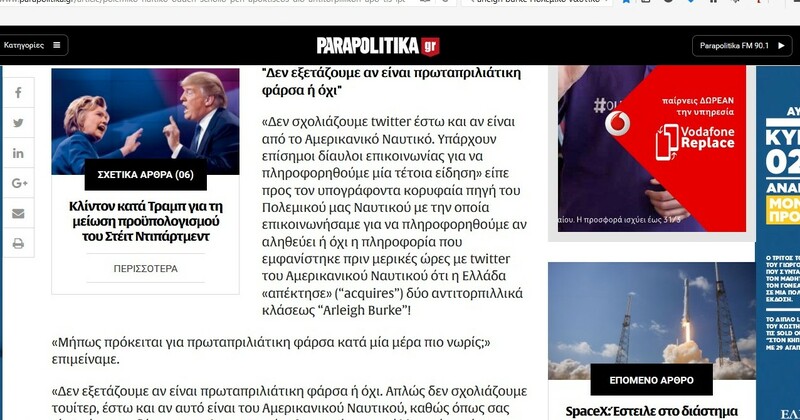 The parapolitika.gr contacted even their sources in the Navy to ask about his news which they could be confirmed or denied. The author of the article does not mention at all my blog but instead states that this is an information from the official Twitter account of the United States Navy!!! The blog staratalogia.blogspot.gr copies and the parapolitika.gr naming the source for the text but not my blog and of course without any link. 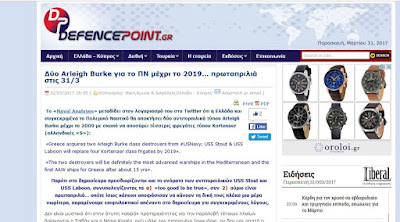 The policenet.gr and greek-inews.gr copy and name as their source for theιr article's text the newsbeast.gr which does not provide any link to my blog but provide an active link to my tweet and I thank them for that. In the text however, newsbeast.gr name the source as the.. magazine Analysis! 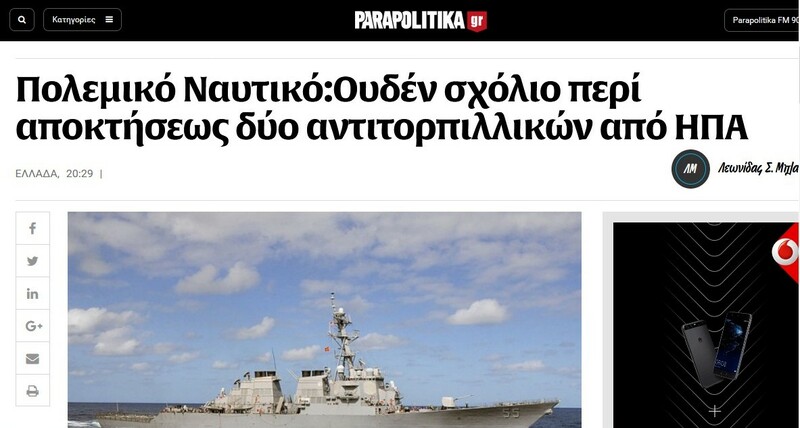 They have added also that Donald Trump himself is ready to give the powerful ships to Greece after the meeting with the Greek Minister for National Defence, Panos Kammenos some days ago! 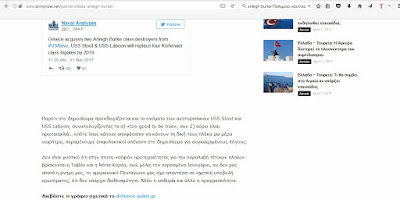 Other blogs like taxalia.blogspot.gr and greek-inews.gr copy the before-mentioned site and they do not provide any link at all. 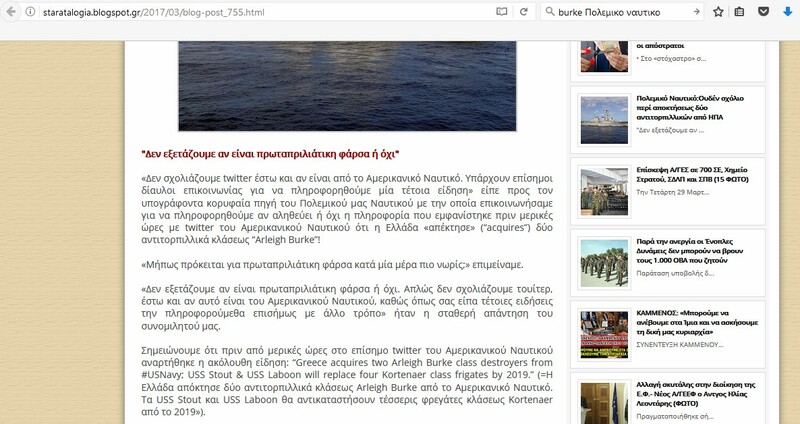 Similarly, other blogs and media, like pentapostagma.gr and amunanet.com which their post was copied completely from pronews.gr (!) mention that the news is based "according to informations from the United States" and without citing my page or my post at all! 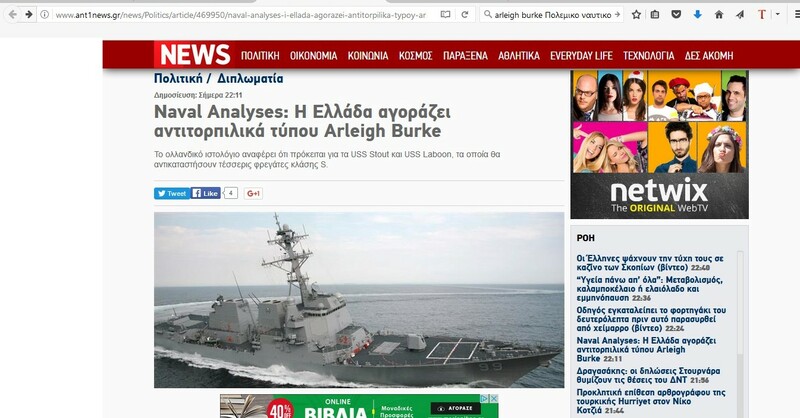 Several other websites, such as el.gr, mentions also according to informations (which they have?) Greece acquires the two destroyers and moreover that the Souda Naval Base will be rebuilt in order to accommodate exactly these two ships! 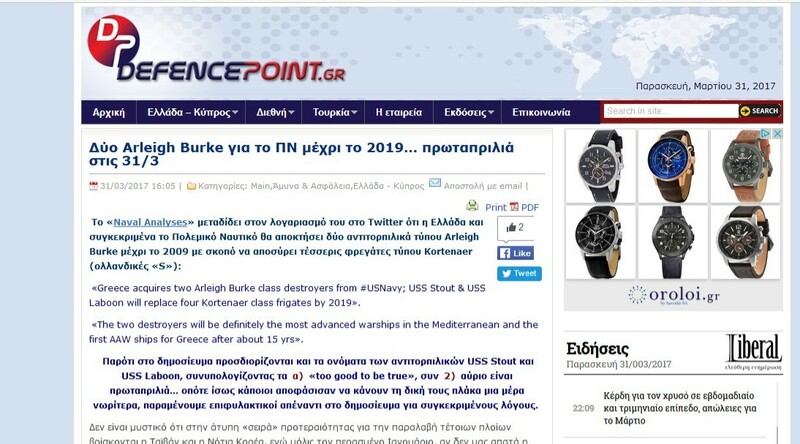 There were also those several websites that are used to copy everything posted by pronews.gr such as www.eviawelle.gr, amfissanewz.blogspot.gr etc. "According to information.." for pentapostagma.gr! If you google "Arleigh Burke Πολεμικο Ναυτικό" or "Greece acquires Arleigh Burke", you will find a dozen more examples of those I mentioned earlier. A complete chain reaction! The author of Ant1 News was somehow suspicious to realize that my news was perhaps not real. In his intro also the reporter mentions that the before mentioned news are reported according to the "original source" rather than making a statement. His post here. Thank you Ant1news! I hope you will keep following me and no one has hurt feelings after this joke. My intention was to prove that the credible sources and most important the professional authors are always sparse and you should evaluate the source carefully. This was a concrete example in order to remind you all how the defense news sites generally report news; the one copies the other and at the end the original source is lost completely. Remember: do not trust those sites that do not provide the original source and those (especially those) who create "news" with the following phrase "according to reliable sources.. blah blah blah" because there is no source. Most of the time, these news are just rumors and the desperate need of the author to create a news article. No source, no news, no reliability. Especially if you are not the first one in the "row". Especially if you have no reporters around the world, neither you visit exhibitions, events etc. Simply as that. Keep exploring the news and ask yourself why the source is not named or/and why the author does not give the proper credits. It is not difficult to cite properly the source, it is a matter if you desire to do so, and I do not speak of course for Twitter posts where sometimes the word limit does not allow you to do so, but even then you should give a try. Do not excuse those who steal other authors' work by translating full articles or copying the entire text and presenting them as theirs without citing properly the source. If you are an ethical author you will gain the respect and the trust of others. I want to leave one message to my followers: do not reward those they steal the work of others, some of us spent important amount of time to write articles with the only motivation to inform you and only, while others steal our work with the main aim to make money with your "clicks" through advertisements and/or to advertise their work when they post very often articles of a named author when they are the authors (!) but they run the blog or website anonymously! Reward with "likes" and "follow" those that really work towards your comprehensive information. 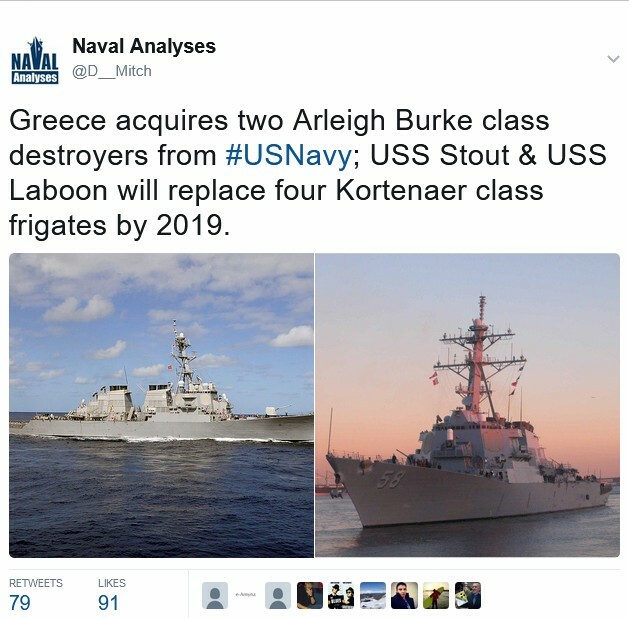 Finally, I do hope one day to see Greece acquiring two such vessels. Hellenic Navy needs them desperately and Greeks want to see their historical naval power maintained and even increased through the years. Do not forget also that Hellenic Navy's roots are lost in the depths of centuries of the history of mankind with a strong and long tradition. It deserves a bright future. He he, you are always so crazy bro! Indeed, I hope we will meet with such a great vessel in the near future. Thank you Λάμπρο, I really appreciate your words. Seriously though, a such move from the shipowners would have been great. To spend a bunch of money to make Averof sailable again should be out of question.